July/August 2018 www.coalage.com 15 rock dust continued investment to conduct full-scale explo- sion tests of its aerated rock dust at the only remaining explosion test facility in the world, the CSIR Explosion Research Facility at Kloppersbos, South Africa. The product worked well and in some of the trials, it actually performed better than traditional rock dust. Hearing about the test results, underground coal operators in South Africa and Australia will soon be using the product, which was invented in the U.S., but can't be used in the U.S. due to regulatory paralysis. Wright Makes First Move Ideally, wet dusting systems would al- low mine operators to apply rock dust on shift. "The potential for foam rock-dust- ing products in the coal mining industry is considerable," said Ryan Murray, vice president, Murray Energy Corp. "The abil- ity to rock dust with little to no particulate rebound, while maintaining or enhancing rock dust applications, would be of inter- est to all underground operators." In December 2016, Coal Age reported that Wright Concrete had received patent protection for its Wright Mix O2 Aerated Rock Dust (ARD). While this was a major milestone for the company, which had been developing and testing it in the field for the last three years, they have since grown frustrated waiting for product ap- proval from MSHA and NIOSH. MSHA said it won't approve a product until it has been properly tested by NIOSH and it no longer has the ability to test the product. Wright completed its initial tests in the U.S. during the third quarter of 2017. "We wanted to make sure it was worth the investment," said Shannon Wright, CEO, Wright Concrete. "The results were good. 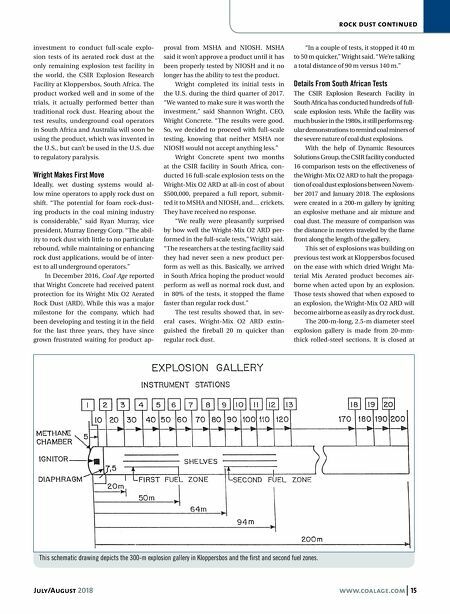 So, we decided to proceed with full-scale testing, knowing that neither MSHA nor NIOSH would not accept anything less." 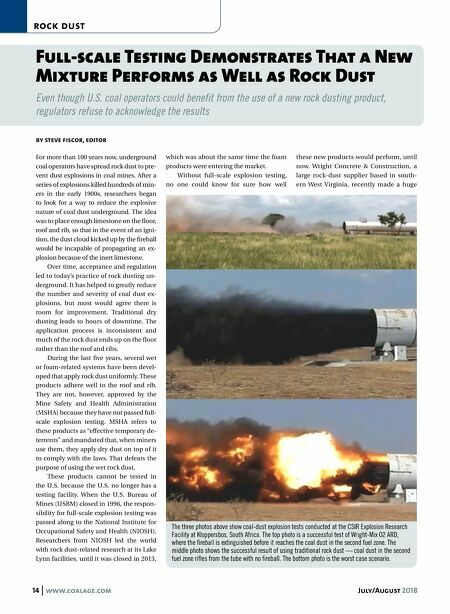 Wright Concrete spent two months at the CSIR facility in South Africa, con- ducted 16 full-scale explosion tests on the Wright-Mix O2 ARD at all-in cost of about $500,000, prepared a full report, submit- ted it to MSHA and NIOSH, and… crickets. They have received no response. "We really were pleasantly surprised by how well the Wright-Mix O2 ARD per- formed in the full-scale tests," Wright said. "The researchers at the testing facility said they had never seen a new product per- form as well as this. Basically, we arrived in South Africa hoping the product would perform as well as normal rock dust, and in 80% of the tests, it stopped the flame faster than regular rock dust." The test results showed that, in sev- eral cases, Wright-Mix O2 ARD extin- guished the fireball 20 m quicker than regular rock dust. "In a couple of tests, it stopped it 40 m to 50 m quicker," Wright said. "We're talking a total distance of 90 m versus 140 m." Details From South African Tests The CSIR Explosion Research Facility in South Africa has conducted hundreds of full- scale explosion tests. While the facility was much busier in the 1980s, it still performs reg- ular demonstrations to remind coal miners of the severe nature of coal dust explosions. With the help of Dynamic Resources Solutions Group, the CSIR facility conducted 16 comparison tests on the effectiveness of the Wright-Mix O2 ARD to halt the propaga- tion of coal dust explosions between Novem- ber 2017 and January 2018. The explosions were created in a 200-m gallery by igniting an explosive methane and air mixture and coal dust. The measure of comparison was the distance in meters traveled by the flame front along the length of the gallery. This set of explosions was building on previous test work at Kloppersbos focused on the ease with which dried Wright Ma- terial Mix Aerated product becomes air- borne when acted upon by an explosion. Those tests showed that when exposed to an explosion, the Wright-Mix O2 ARD will become airborne as easily as dry rock dust. The 200-m-long, 2.5-m diameter steel explosion gallery is made from 20-mm- thick rolled-steel sections. It is closed at This schematic drawing depicts the 300-m explosion gallery in Kloppersbos and the first and second fuel zones.